No one wants to experience back pain on Thanksgiving Day. Thanksgiving is for family, friends, and delicious food. But with all the food that needs to be cooked and everyone milling about, back pain is a real problem that you may experience. We’ve compiled a short list of tips to keep back pain away on Thanksgiving, so keep reading for a pain-free feast. Practicing correct posture is important every day, but on Thanksgiving you may forget in all of the festivities. Back pain can arise when you’re hunched over the cutting board, leaning against the wall, or slouching at the table. Don’t know what proper posture looks like? Take a moment to read through our blogs on correct sitting and standing posture. We know how hard it is to tear yourself away when preparing a feast of that magnitude, but if you enlist help it’ll be easier to manage. Let family and friends take over kitchen duty for 10 minutes every hour or so and allow yourself time to breathe. Not only will these breaks give you a chance to sit down, you can also spend some time chatting with everyone that has gathered at your house. Daily activity is an important part of any day and Thanksgiving doesn’t change that fact. Take a walk around the neighborhood with your family or play tag with the kids – anything to get your blood pumping. Doing so might even help wake you out of that post-turkey slump and help you digest all of the goodies. If getting active didn’t help wake you up, you’re probably looking for a couch to nap on. Instead of sinking into the couch, opt for a bed. Can you remember the last time you woke up from a nap on the couch without any pain? Most people don’t sleep in a healthy position for their spine on the couch, which is why we recommend curling up in bed instead. 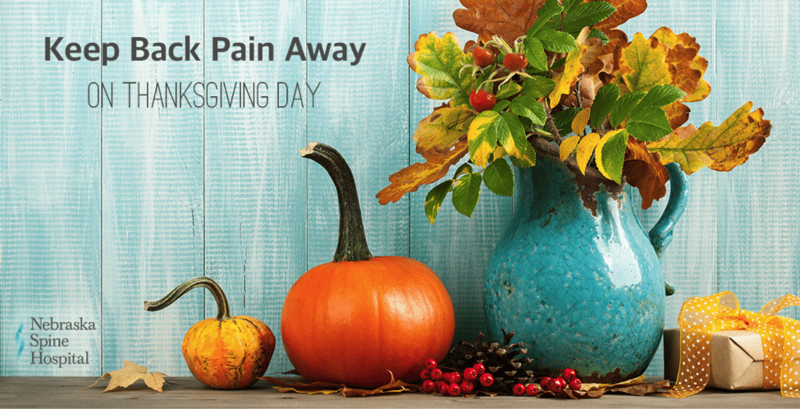 We hope that these tips help to keep your back pain away on Thanksgiving Day. From everyone here at Nebraska Spine Hospital, we wish you and your family a happy Thanksgiving!